This grilled chicken deserves a spot in your weekly dinner rotation. The grilled romaine is very good. I had never heard of grilling lettuce! Preheat grill to medium-high set up for direct and indirect grilling. Loosen skin of chicken and spread garlic underneath. Season with salt and pepper. Grill over direct heat, breast-side down, covered, until golden-brown and charred, 5 to 7 minutes. Flip and grill over indirect heat, covered, until an instant-read thermometer inserted into the thickest part registers 165 degrees F, 35 to 40 minutes. Meanwhile, combine Parmesan, parsley, hazelnuts, lemon zest and juice, and 3 tablespoons oil in a bowl. Season with salt and pepper. Brush romaine with remaining tablespoon oil. Season with salt and pepper. Grill, over direct heat, turning once, until charred and wilted, 1 to 3 minutes. 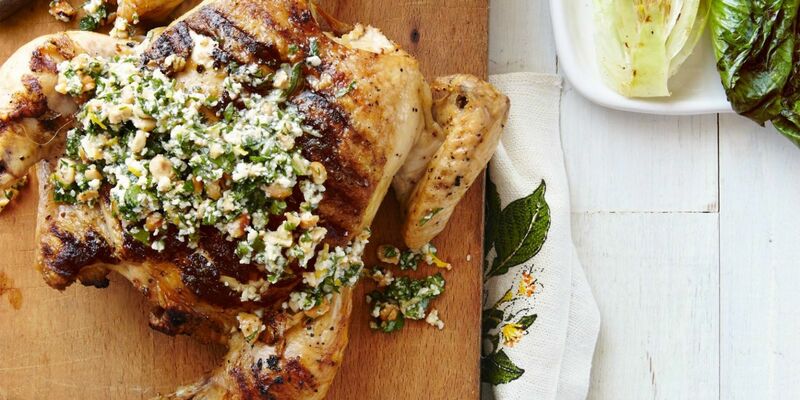 Serve the chicken and romaine topped with the parsley-lemon sauce. Hats Off to One of the Most Versatile Cookies on the Planet! French Fries and Tater Tots Have Nothin’ On this MAGIC POTATO! I Double Dare You to Make This Oreo Ice Cream! 10 Amazing Benefits of CHLOROPHYLL! The Real Truth about Baby Carrots! Bucket won't fit under sink faucet? Is God Done with You?